Aaron, tell me something about yourself. I am a married father of two young children. I enjoy staying at home and hanging out with my family. I don’t remember a specific item. It was most likely cookies during a Holiday. I don’t have a least favorite food. I am open to trying different foods. I don’t have a favorite cook. I enjoy Matt’s Red Rooster (Flemington) and Origin (Somerville). 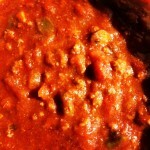 Spaghetti Sauce, simple and flexible. My 2 favorite recipes are Baby Back Ribs and Spaghetti Sauce. Both taste good and are easy to make. Soak ribs with water and salt or vinegar for about an hour. Rinse ribs. Remove membrane from underside of ribs. Pat ribs dry. Season ribs liberally with seasoning of choice. Place ribs in cookie sheet with sides. Add chicken broth and cover tightly with aluminum foil. Bake in oven – 350 degrees for 2 hours. Remove from oven and drain. Put BBQ sauce on one side and place under broiler until sauce bubbles. Turn over and repeat. Remove ribs and eat! Aaron is an intuitive and flexible chef. 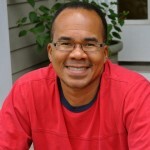 His cooking style is causal and his recipe allows for personalization. 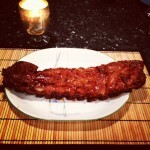 I cooked two racks of ribs weighing 5.22 lbs. I added 5 tsp of Rudy’s Rub and baked the ribs for 2 1/2 hours and then had them under the broiler on high for about 3 – 4 minutes each side. These were some of the best ribs I have ever eaten. So simple to make and I know I will make them again, and again. YUM!!! These are the best cooked ribs I ever had. I love the spicy and sweet combination. Sweet, hearty sauce with perfect amount of kick! 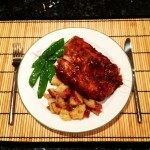 Meat falls off the bone… scrumptious! Saute green pepper, onion, and mushrooms. Add chopped garlic, pepper, a little salt, and Italian seasoning. Add red pepper flakes to taste. Add sauteed vegetables to sauce. Separately brown ground beef or turkey. season with salt and pepper. Drain meat and add to sauce. Add more garlic and seasoning to the sauce. Do not add more salt without first tasting. Add a bit of sugar to combat bitterness, but not too much. Simmer for a couple of hours or more stirring occasionally so sauce does not burn on the bottom. Taste during the process and season to preference. This was a real easy recipe to make. 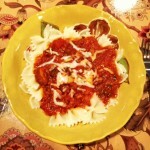 I used 2 jars of Bertolli Vineyard Marinara sauce with Burgundy wine and 1 jar of Bertolli Olive oil with Garlic sauce. 5 cloves of garlic, 1 tsp of pepper powder, 2 tsp of salt, 2 tsp of Italian seasoning, and 1/2 tsp of red pepper flakes. I also added 1 1/2 tsp of sugar. I cooked the sauce on low heat for 2 hours. I served it over Bow Tie pasta and sprinkled a little cheese on top! Delicious!! Perfect blend of meat and vegetables. Sweet flavor brings out the meat flavor nicely. Previous: This Little Light of Mine. Well……….we shall certainly have to try your recipe on baby back ribs then. It reads delicious! All the very best and it was good meeting with you at the party although rather briefly.